As the best sites for wind farms continue to get snapped up, companies are looking at alternative locations for alternative energy projects. 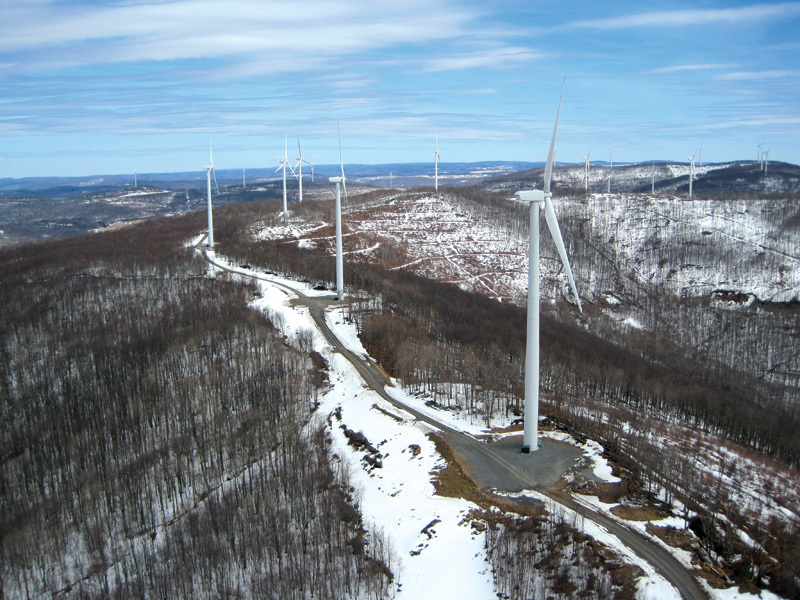 Renewable power development company Invenergy chose privately owned timberlands in West Virginia for its latest wind power project. Invenergy Wind recently completed the 100.5 MW Beech Ridge project on private forest land, owned by MeadWestvaco Corporation, in West Virginia. The Beech Ridge project has proven successful and could lead Invenergy to look at other private forest land sites for future projects. As the best sites for wind farms continue to get snapped up by wind farm developers and utilities, a relatively untapped source of land for U.S. wind power projects is emerging: the country’s incredibly large holdings of privately owned timberlands. One of the country’s largest forest companies, Weyerhaeuser, owns millions of hectares in the wind-rich Pacific Northwest, for example. Wind power developer EverPower recently entered into an agreement with Weyerhaeuser to explore for, and develop, wind energy resources on several of Weyerhaeuser’s tree farms—and it has already put forward one proposal. EverPower’s proposed 120 MW Coyote Crest Wind Park would be located on more than 3,000 acres of Weyerhaeuser land in southwestern Washington. The project site is located in a remote and unpopulated section of Lewis and Pacific Counties that is characterized primarily by commercial forestry use. Projects are well advanced in other parts of the country. 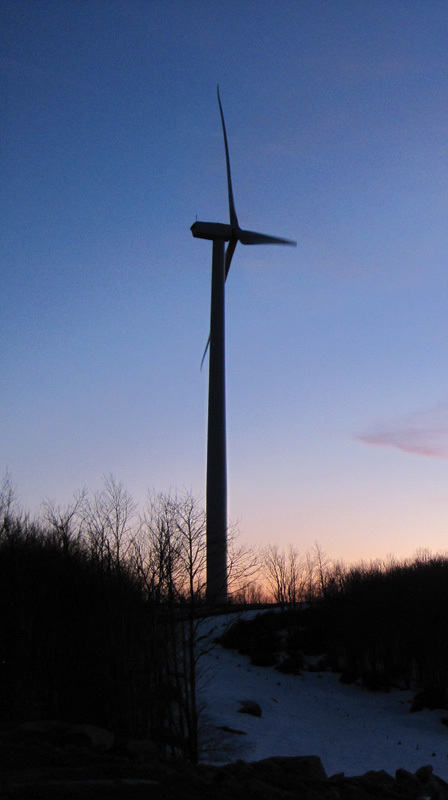 In West Virginia, another renewable power development company, Chicago-based Invenergy Wind LLC, recently completed the 100.5 MW Beech Ridge project on private forest land. The land is owned by MeadWestvaco Corporation, a manufacturer of packing products. The Beech Ridge project has proven successful and could lead the company to look at other private forest land sites for future projects. Invenergy’s involvement with the West Virginia site actually dates back a number of years, to 2003, when it started gathering wind speed data and reviewing permitting requirements. Generally, the State of West Virginia as a whole has a good wind resource, and there is potential for further wind power development. However, many of the best sites in the state are on public lands, making development more challenging than developing on private land. The Beech Ridge site in Greenbrier County, in the southeastern part of the state, had actually been explored for wind development opportunities back in the 1990s. Kenetech Windpower, one of the major wind power players in the U.S. at the time, had a number of met towers collecting wind data. This gave Invenergy a bit of a head start on the wind data gathering process. Invenergy also reviewed existing wildlife studies, in addition to starting their own extensive studies. “The towers that Kenetech had put up were no longer functional by the time we started working on the site,” explained Dave Groberg, vice-president, eastern U.S., for Invenergy. “We still needed to go ahead and do our own monitoring, but we were able to look at and evaluate some of the data that Kenetech had compiled. “We felt the site was very competitive—it has some of the strongest wind speeds available on private land in the state of West Virginia, and in general, in the eastern part of the PJM market,” added Groberg. PJM Interconnection is a regional transmission organization (RTO) that coordinates the movement of wholesale electricity in all or parts of 13 states and the District of Columbia. The Beech Ridge turbines are located entirely on land owned by MeadWestvaco—there are no other private or public owners. MeadWestvaco owns about 60,000 acres in the area where the project is located, and a total of 100,000 acres in the region as a whole. “The site where Beech Ridge is located historically has been, and continues to be, actively managed for timber, coal, oil and gas exploration, and hunting leases—and those are all uses that are compatible with utility scale development of wind energy,” notes Groberg. Being able to negotiate with a single land owner made the task of getting the land lease simpler. But there were still discussions about the impact of a wind farm. Invenergy had to deal with additional landowners on the larger project. The site is about 14 miles from an interconnect with the grid, so they had to negotiate easements with landowners along the transmission line route. But even there, the second largest landowner is Plum Creek, another large commercial timber land company. Plum Creek has seven million acres of land in timber producing areas throughout the U.S. The Beech Ridge site is fairly well located—it sits about 20 miles from a federal interstate. “We had a fairly good public road system leading up to the site boundary,” says Groberg. Because of the timber harvesting and other activities on MeadWestvaco lands, there was a good road network already in place. “One of the benefits of working with a large timber company is that they build very good roads,” says Groberg. “We had to put in some significant upgrades in some places, but we were able to use the existing road system for the most part.” Timber harvesting requires some fairly heavy equipment, and the road system was built to handle big and heavy loads, though perhaps not quite as big as nacelles and sections of wind turbine towers. Area roads were also heavier duty due to the extensive coal mining in the region, and in West Virginia. How snowy? Try snow drifts of over 10 feet. There was a minimum amount of turbine re-siting with Beech Ridge. “There are always some adjustments you make in the field, and this was no different in that sense,” says Groberg. Construction of the project went out to bid, with White Construction Inc. handling the civil portion and wind turbine tower erection, and Aldridge Electric managing the construction of the collection system, the substation, and the transmission line. In terms of project approvals, West Virginia has an established siting process for independent power plants—all projects have to go through a well-defined formal review process with the state Public Service Commission to get a siting permit. Though there are several other wind power projects in the state, Beech Ridge was the first wind power project to be permitted under some new revised guidelines. “Some of what we did was new to the PSC and its staff, but it went fine.” Groberg said that based on Invenergy’s experience working on wind power projects around the U.S., West Virginia has some of the most rigorous permitting regulations. Other ancillary permits had to come from the U.S. Army Corps of Engineers and the West Virginia Department of Environmental Protection. Building permits had to be obtained from the county. The project has been the subject of litigation over its possible impact on the bat population in the area. But Invenergy says it has done its homework—and then some—related to the environment. “We arranged the timing of our construction to avoid impacting the potential habitat for bats. And we are in the process of obtaining an incidental take permit that will include design and operating requirements that avoid, minimize, and mitigate the potential impact to endangered bat species and reduce impacts for non-listed bats too. In terms of Invenergy’s wind power projects, Beech Ridge (with its 100.5 MW capacity) falls about in the middle, in terms of size. Invenergy is one of the largest independent wind developers in the United States. It has placed 20 wind generating facilities in operation, representing an aggregate generation capacity of over 2,000 MW, in North America and Europe. Another 450 MW of Invenergy projects are currently under construction, 750 MW are under contract, and nearly 100 projects are in active development in the United States, Canada, and Europe. “We’re building a portfolio of utility scale projects throughout the U.S. in just about every part of the country. We’re active pretty much everywhere there is potential for wind power,” says Groberg. This includes projects in about a dozen states: from New York in the east and Illinois in the Midwest, to Texas in the south and Washington in the Pacific Northwest, as well as projects in Colorado and Oregon. And now, West Virginia. While there is likely to be a lot of opportunity for further wind power development on private timberlands, Groberg agrees with many industry watchers, saying the real challenge for the industry is finding transmission capacity. Transmission system upgrades are essential to further long term wind power development, he says. A national Renewable Energy Standard (RES) still remains a possibility, which would help the industry considerably. Invenergy is very active with the American Wind Energy Association—the company’s president and CEO Michael Polsky (an advocate of an RES) is on the AWEA board of directors.